Thirteen tales of cats. This one started of real good, then two thirds, it faltered. Yet, if the reader likes cats and elements of the unknown, then this is a good anthology to read. "The Stargazer's Familiar" by Mary Jo Putney. An evil's man prophecy for power if fulfilled, though not the way he anticipated thanks to Leo the cat. "Three Inch Trouble" by Andre Norton. It's monkey business on a ship and up to Raven, the ship's cat, to save the day. I knew there was a reason ships had cats, even space ships. "Purr Power" by Jody Lynn Nye. Cat's show their strength and why they're worshipped in ancient Egypt. "Star" by Kristine Kathryn Rusch. A cat heals a broken woman when no one else can, but how is it possible? Touching story about a bond between human and animal. "Under the Sign of the Fish" by Karen Haber. A woman tries to get her cat to stop trying to snare the fish, but nature wills out, to her dismay. Some people never learn never to mess with Mother Nature. "Every Life Should Have Nine" by Mickey Zucker Reichert. Two soldiers looking at a woman under suspicion of being a sorceress find more than what one expected. "Once, We Were Worshipped" by Diane A. S. Stuckart. A cat tries to reclaim the glory of being worshipped by resurrecting an Egypt mummy cat, only something goes horribly wrong. "Praxis" by Janet Pack. An astrologer makes good with the help of his cat. Good story. "Death Song" by Bill McCay. A cat fights to the death to protect his human family. Good, but sad story. "A Light in the Darkness" by Pamela Luzier. A woman tries to find her no-good, louse husband before he can steal their daughter away, but she's waylaid with her plans. "Mu Mao and the Court Oracle" by Elizabeth Ann Scarborough. Mu Mao helps with the coronation of the new cat king and the oracle. "Star Song" by Nina Kiriki Hoffman. A divorcee leaves a compound and conjures up friends thanks to a book she didn't realize she had. Didn't really like or get this one. "Ecliptic" by Von Jocks. Witches and their familiars try to survive prejudices and maybe redeem the humanity of men. is it just my imagination, or does Jody Lynn Nye contribute to all sorts of anthologies? Actually, there are several authors whose names I see cropping up. Freisner's been in three, Ron Goulart's been in a couple, Christine F. York, Elizabeth Ann Scarborough, Mickey Zucker Reichert, the Resnicks, and a few others who I can't recall at the moment. However, I kind of like this style of review for anthologies, so I think I'll keep it for the time being. I'm positive I'll run across the same stories/authors which manage to find themselves crossing anthologies. Diane - the cover is intriguing, which probably raised my hopes for the book. 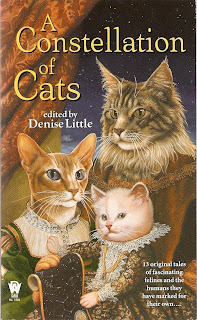 The Catfantastic set has some wonderful covers as well.